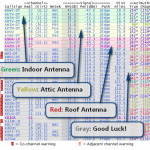 Choosing the right antenna for your home is easier than you think. One thing that scares potential cable-cutters is the prospect of choosing an antenna for their home. Many wonder, “do I need to climb up on my roof and mess with grounding wires and guy lines?” Or sometimes they go out and buy the Terk HDTVa, thinking that its good reviews mean that it will work great on top of their TV. You may ask, “How do you get those figures and what do you do with them?” Follow along with me now and see. I know just the place to get those figures: the TVFool.com TV Signal Locator. Once there, you enter your address. The Title for the report and the Antenna Height are optional. I’d leave them both blank at first. Push the “Find Local Channels” button and you’ll get something back like the image to the right. The report looks overwhelming at first, but really it’s quite simple to interpret. You just need to remember to look at the Strength, Direction, and Band of the different stations in the area. Let me show you how to read those from the chart. 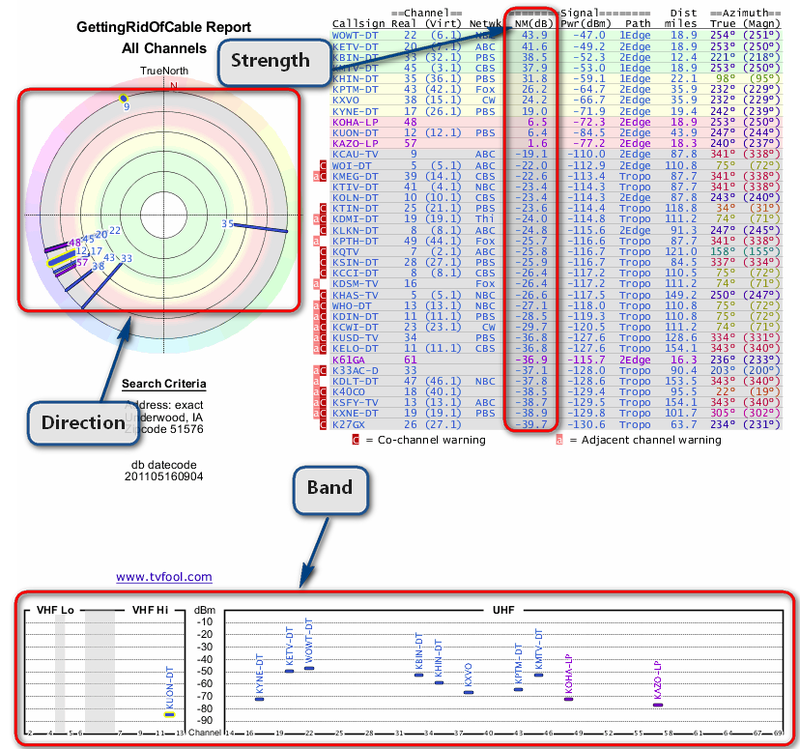 In the column marked NM(db) we’ll read the values for signal strength. NM stands for Noise Margin and it is measured in decibels. Essentially a number above 0 means your TV can understand the TV signal. Below 0 and it can’t. Keep in mind, though, that lower noise margin stations are tougher to pull in because they are so sensitive to the fluctuations in signal strength due to the weather, trees, kung fu fighters, interference from other signals, you name it. The higher the noise margin, the less likely fluctuations in signal will affect you. 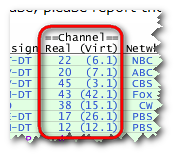 TV Fool color codes the report to give you visual indicator of how strong the signals are. The green stations are those with a signal so strong that you can use an indoor or set-top antenna to pull it. 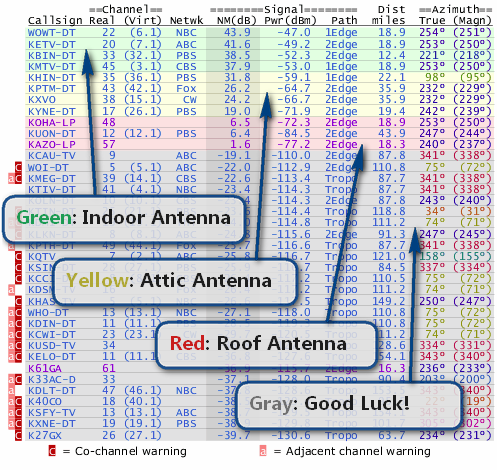 The yellow stations are signals that are a bit weaker—so they would require an attic antenna to pull it. The red stations are those that require a roof-mounted antenna. And finally, the gray signals, while they are accessible, you should seek the services of a professional antenna installer in order to pull them. This is the easiest part of the chart to understand. The TV towers are found in different directions. 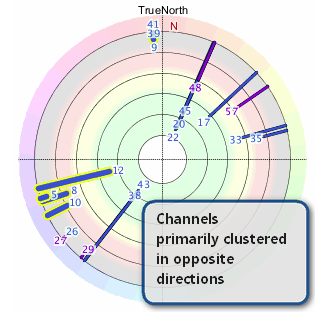 Ideally, almost all the towers will be clustered in the same direction and then you can point a strong directional antenna toward the cluster. An example of that can be seen in the image to the right, where 11 of the 12 red/yellow/green stations are all clustered in the Southwest of the radar image. The TV Fool report shows the direction of the signal and represents stronger signals by showing a longer bar leading from the outside edge. 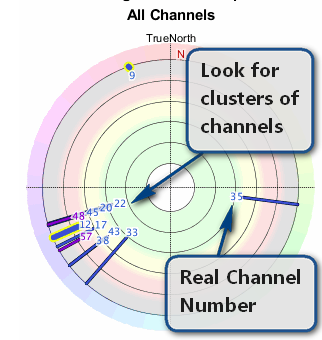 Also shown is the channel’s real channel number—which represents what channel/frequency the channel is transmitted at, not what shows on the tuner. That’s the virtual number. If you live 20 miles or so from a major city, this is most likely the situation you’re in. An example of this is in the image above, which shows 11 of the 12 viewable stations to the Southwest. This is great because you just need to point your antenna in one direction. You don’t have to mess around with antenna combiners or with antenna rotors. You just need to get a directional antenna. Directional antennas (antennas that are meant to “look” in one general direction) are also more sensitive than omnidirectional (antennas that are meant to look in all directions)—so you are able to pull in stations from farther away. Good Case Scenario: Desired channels are scattered, but close by. So maybe your stations are in different directions, but they are still pretty close. In this case you can still get these stations without the need for an antenna rotor. You will, however, need a good omnidirectional antenna, or a directional antenna that has a wide beamwidth. If you live between two major cities, this may be your situation. You have good signals, but they are coming from two different directions. If you’re using an indoor antenna, you may have to rotate your antenna by hand to pull in stations from the different directions. If you put your antenna on your roof or in your attic, you may have to install an antenna rotor. A rotor is a little motor that connects to the base of your antenna mast and rotates it to point toward the tower broadcasting your chosen channel. Another option is to combine the outputs of two antennas, but that’s something we’ll leave for a future article on GettingRidOfCable.com. Now it may be the case that the channels you want to receive are far away and in different directions. This isn’t the end of the world—you can still use an antenna to receive free TV signals, but it may require you to point antennas in different directions and combine their signals, or use an antenna rotor. Either way, you should call the TV stations you’d like to receive and ask for tips to receive their station. You may also want to seek out a professional antenna installer in the area who knows the best way to get these free TV channels piping hot to your television. Remember the old VHF and UHF dials on your TV set when you were a kid? Well, HDTV signals also are broadcast on the VHF and UHF bands. 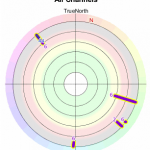 This is important because different antennas are tuned to either VHF or UHF—although most antennas can pick up both VHF and UHF to some extent. VHF stands for Very High Frequency. 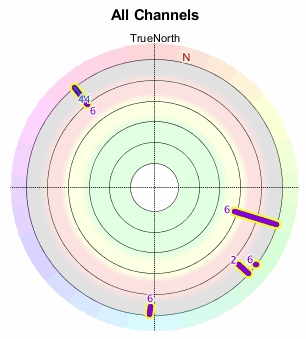 Channels 2-13 fall into the VHF range. UHF stands for Ultra High Frequency. Channels 14-69 fall into this range. Over 73% of the USA’s TV stations broadcast using a UHF frequency. 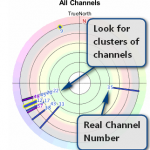 Most good UHF antennas are able to receive the high-band VHF channels: 7-13. 92% of the VHF TV channels use the high-band VHF frequencies. Why is this important? 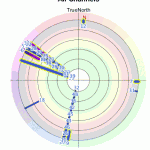 This means that a good UHF antenna is capable of receiving 97% of the channels if it is within range. However, if you have a desired channel that is broadcast on the low-band VHF channels 2-6, you may need to look for a UHF/VHF antenna or supplement your UHF antenna with a VHF one. Does the Number that Shows on the TV Dial Represent How It Is Broadcasted? Just because you turn your TV dial to channel 3 it doesn’t mean that that TV channel is broadcasted over VHF frequencies. Because the FCC mandated that every station embed a “reference” to how the channel should show in your TV lineup—your channel 3 News could actually be broadcasted from channel 45. Hence the station has a VHF-like channel number on the dial when in fact it is a UHF station. This is represented in the TV Fool Chart as Real and Virtual. Real is how the station is broadcasted and tells you whether it is a UHF/VHF station. Virtual is how it shows up on your dial. Now that you understand the basics, you are well on your way to choosing the right antenna for your home. 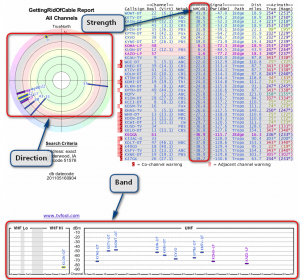 Let me just go over some common antenna situations so I can give you some loose recommendations for antennas. 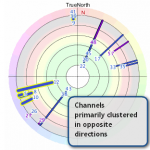 If you are fortunate enough to live in a city with many transmitters, you are looking for an omnidirectional (aka multi-directional) antenna or a directional antenna with a wide beam width. I actually think this is better than living in a city with many transmitters, because you can take advantage of a directional antenna and point it in one direction. 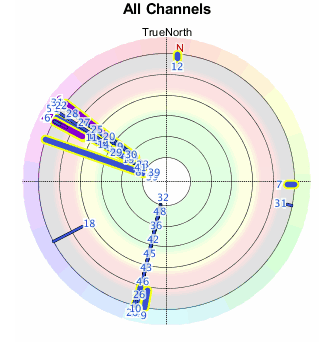 My recommendations for indoor antennas remain the same, but I do recommend a different Antennas Direct antenna. This is the trickiest situation, obviously. If you are within 50 miles or so, you shouldn’t have much of a problem, but if your stations are scattered in different directions, you may need to call a professional who can help you mount your antenna on your roof. The pro may also hook up your antenna to a rotor, or install multiple antennas and combine the antenna signals. I hope this served as a useful guide on how you can use TvFool.com to choose the best HDTV antenna for your home.